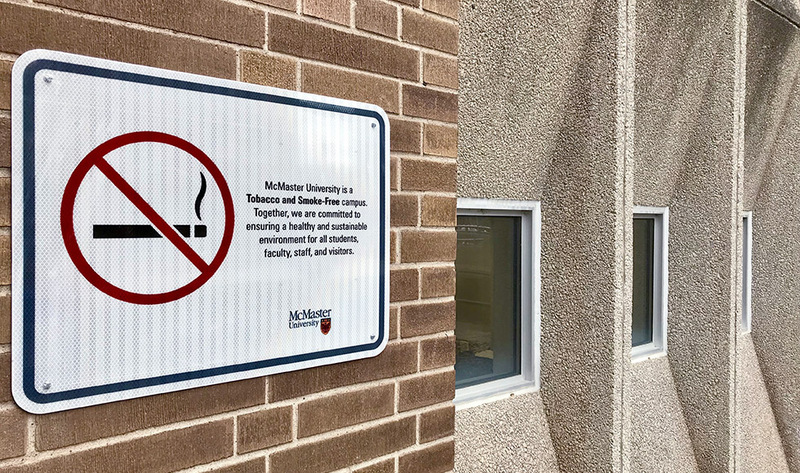 McMaster’s tobacco and smoke free campus designation has significantly lessened exposures to second-hand smoke, reduced campus litter and encouraged more people to quit smoking. These are the findings of an independent student-led community survey, conducted six months after the University became the first in Ontario to designate itself as tobacco and smoke-free. “The survey shows there are positive and measurable gains thanks to the implementation of the smoke free campus,” says Harman Sandhu, a Master of Public Health Student and a member of the team undertaking the survey. The survey included wide-ranging questions about awareness, smoking behaviours, smoking cessation and second hand smoke exposure. Over 1600 responses were received, with more than one-third from students and nearly half from faculty and staff. Alumni, community members, campus visitors, contractors, and other short-term employees also participated. The survey found widespread knowledge of the smoke free campus initiative. Almost all (93 per cent) respondents were aware McMaster was tobacco and smoke free. One-quarter of smokers surveyed said they had quit smoking since the smoke free campus was launched in January. Another one-third indicated they were interested in quitting smoking by the end of this year. Nearly three-quarters of all respondents report significant reductions in campus exposures to second hand smoke. The students found a 14 per cent reduction in discarded cigarette butts littering campus. “The survey aims to examine policy implementation in order to understand what is working well and what can be improved to achieve the intended impacts in a way that is responsive,” says Sandhu. The survey is part of a larger evaluation of the policy spearheaded by a team of students. It includes data collected through a smoking litter audit of hotspots on campus, tracking the uptake of reduction and cessation resources, and tracking data provided by Facility Services and Security Services. “It’s been beneficial to be able to work so closely with representatives from the Committee, to ensure our evaluation findings are relevant and can be used by those involved in policy implementation,” explains Jennifer Friesen, who was involved in coordinating the evaluation. Throughout the evaluation the team received guidance from the Hamilton Public Health Services, Leave the Pack Behind, and the Student Wellness Centre and Human Resources Services. Since the Tobacco and Smoke Free designation on all McMaster-owned properties, other institutions including Guelph University, Western University, Brock, Sheridan, Mohawk, and St. Lawrence College have also considered applying the designation to their own campuses. More information about McMaster’s Tobacco and Smoke Free Campus policy can be found online.